Transportation The City Bus No.59 to Ryoanji-mae, or No.50, No.55 to Ritsumeikan Daigaku-mae and 7-min. 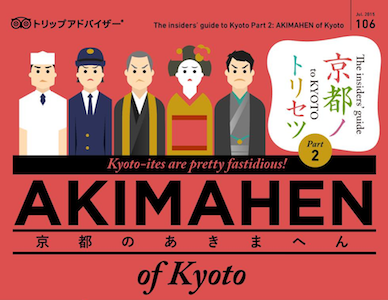 walk, The Randen (Keifuku ) Line to Ryoanji-michi Station and 7-min. walk. 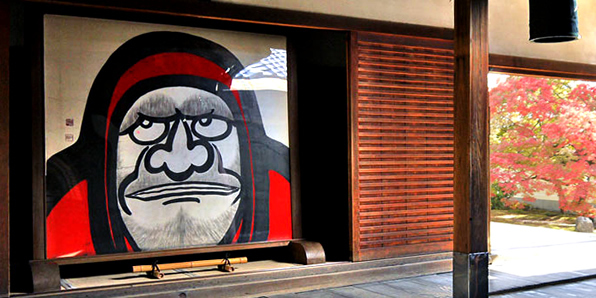 Ryoanji was founded by the Muromachi Period military leader Hosokawa Katsumoto in 1450. The temple belongs to the Rinzai Zen Buddhist sect, and its karesansui (dry landscape) rock garden is the most famous Zen garden in Japan. 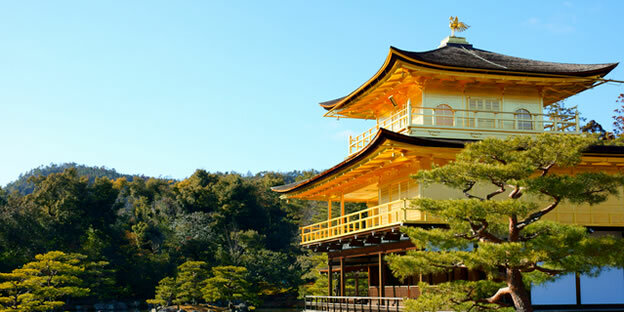 Ryoanji blazed into prominence as a Zen temple from the time of its founding. 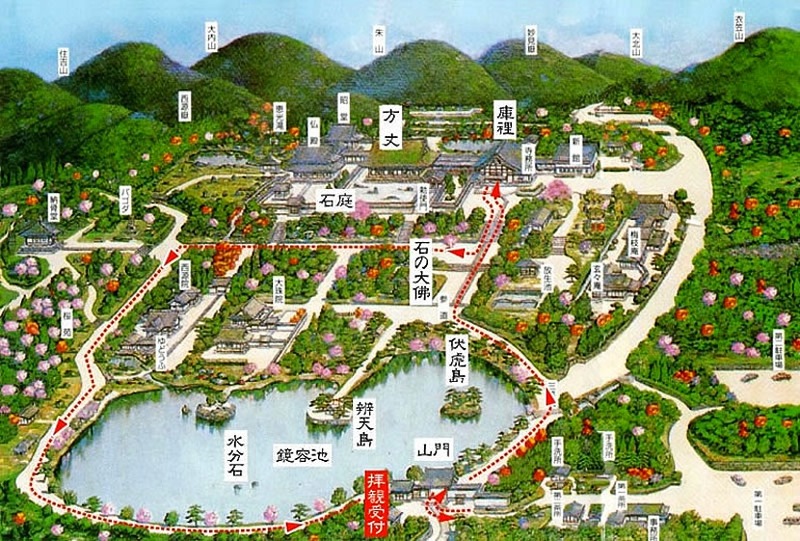 At its peak, Ryoanji boasted grounds several times their current size, with some 21 branch temples strewn across the site. Like much of Kyoto around it, Ryoanji was destroyed by fire during the Onin War, a particularly brutal civil war which divided the city into two parts. However, the temple was rebuilt relatively shortly after the war. Eventually, Toyotomi Hideyoshi managed to unify the factions of Japan under the Emperor, and Ryoanji was placed under the control and protection of the Edo shogunate. 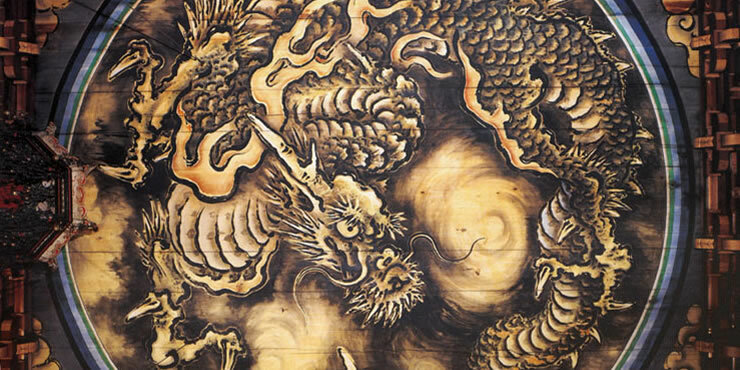 The popularity of everything Zen in the West began with the works of D.T. Suzuki. 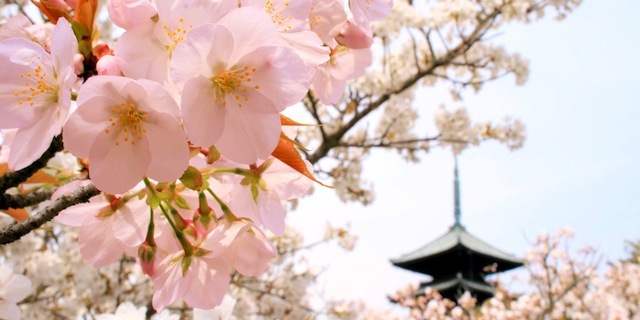 Eventually, the trend grew into the worldwide “Zen boom” of the 1960s and 70s, culminating in an official visit to Ryoanji by Queen Elizabeth II. 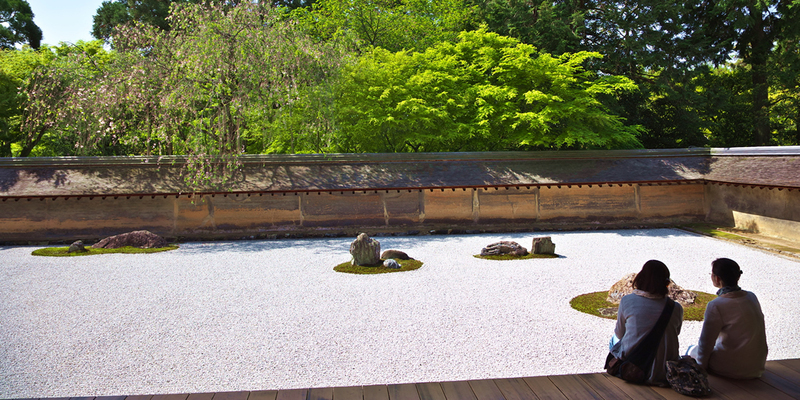 Her effusive praise for the rock garden helped establish Ryoanji as the embodiment of Zen thought in the world’s collective imagination. 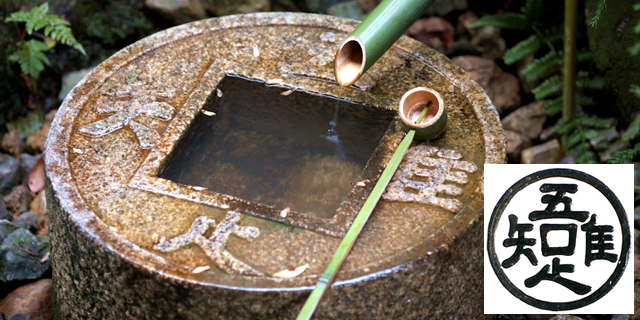 In the teahouse garden lies a stone basin known as a tsukubai, traditionally used for washing hands before participating in the tea ceremony. The Ryoanji tsukubai is famous for the poetic Zen saying chiseled on the surface of its frame, and the fascinating device by which the thought is conveyed. The four characters surrounding the central opening are 吾(ware), 唯(tada), 足(taru-wo), 知(shiru), which can be translated as “I,” “learn,” “only,” “to be content.” However, all four characters are incomplete because they are written without the 口 element that forms a part of each one. The central opening of the tsukubai, in the shape of a square, provides this element. The philosophy expressed here is the quintessential Zen view that richness of spirit comes from “learning only to be content” – knowing satisfaction instead of longing, and being happy with what one has. Those who recognize their blessings are contented and spiritually fulfilled; the dissatisfied, who cannot control their desires, are spiritually impoverished. Composer and philosopher John Cage, a seminal influence in modern music, began a composition titled Ryoanji, after the temple. 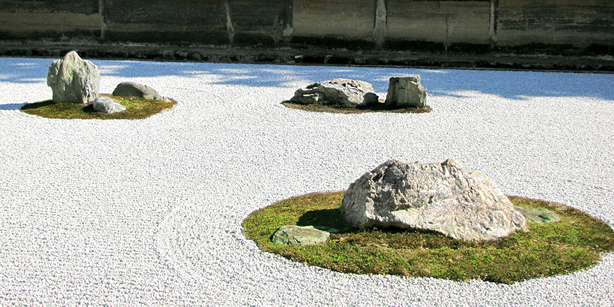 It is a musical representation of the rock garden from which he drew his inspiration. Ryoanji remains one of Cage’s most famous works. 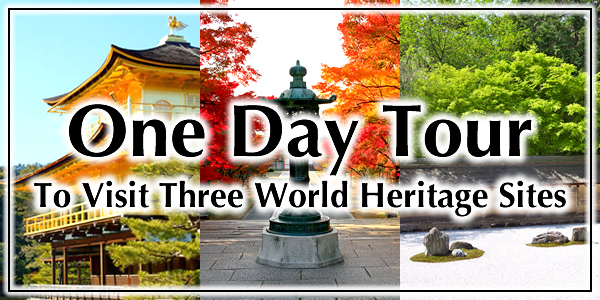 Ryoanji was recognized by UNESCO as a World (Cultural) Heritage site in 1994.